We’re beginning to wind up our list of Games to Play on Halloween and realized that we’ve given a lot of attention to monsters and ghosts, but have neglected one of the most common Halloween creatures of all time – zombies! 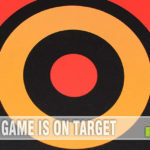 There is no lack of games with a zombie theme as it has been a popular genre for the past few years. We’ve covered a number of them, including Hit Z Road, Zombies!!! and Zombie Dice. Typically in these types of games you must avoid or kill the zombies, trying to escape whatever predicament you are in alive. 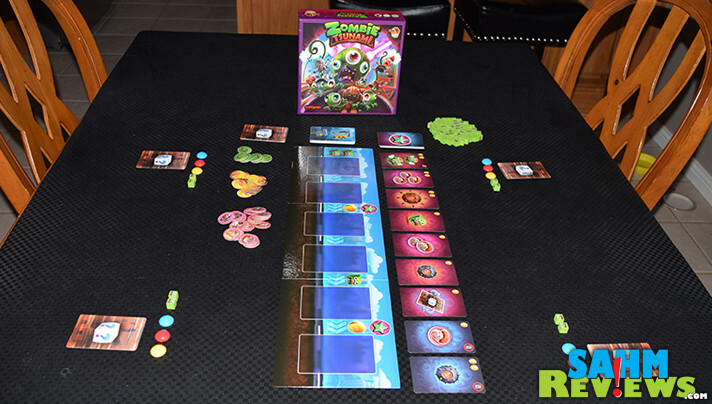 Zombie Tsunami by Lucky Duck Games takes a different path in their zombie-themed card game. Instead of vanquishing hordes of zombies, you are trying to collect as many as you can before the game ends! In fact, you are leading your own horde of zombies storming a city while avoiding the humans who are trying to stop you! 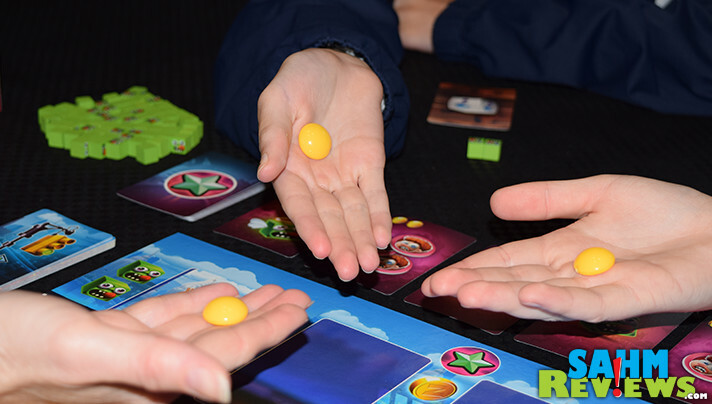 You and up to five other players all receive a set of three voting beads and a random Secret Bonus Card during the game’s setup. 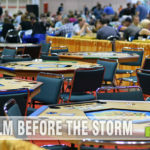 The board is put in the center of the play area and a number of cards (depending upon the number of players) are dealt out above it, creating the “Shop”. A separate Street Deck is also created and placed to the left of the game board. You are now ready to begin a game of Zombie Tsunami! 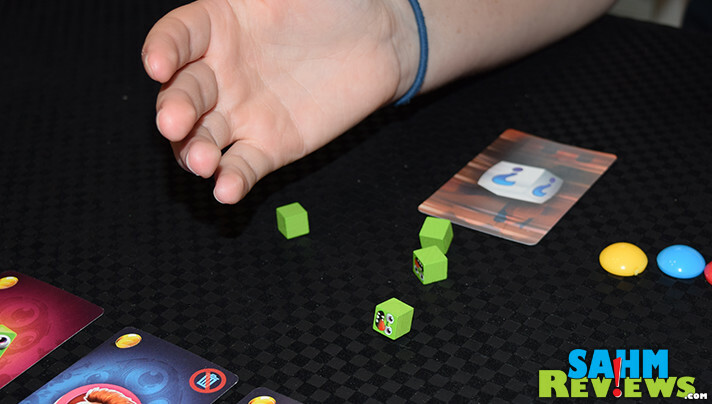 At the beginning of each round all players add two zombie cubes to their horde along with an additional Secret Bonus Card. 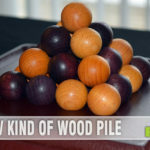 We’re all used to those tiny wooden cubes used in modern games to denote a supply item or utilized as a tracking marker. 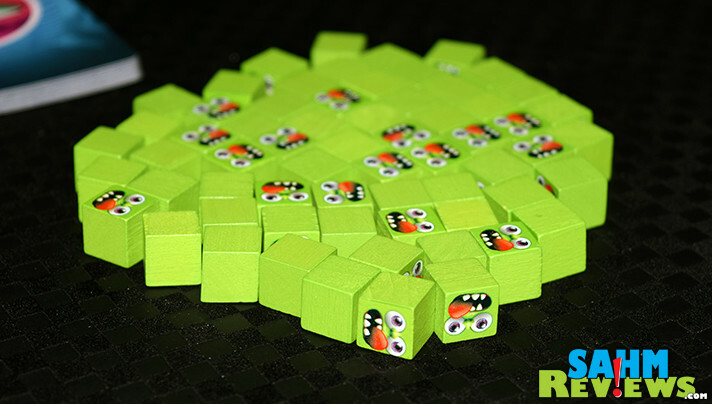 In Zombie Tsunami they act as tiny dice with a zombie face printed on one side! These will come into play in a moment. One player is put in charge of revealing cards from the Street Deck onto the board. Cards are turned over one at a time and resolved immediately. 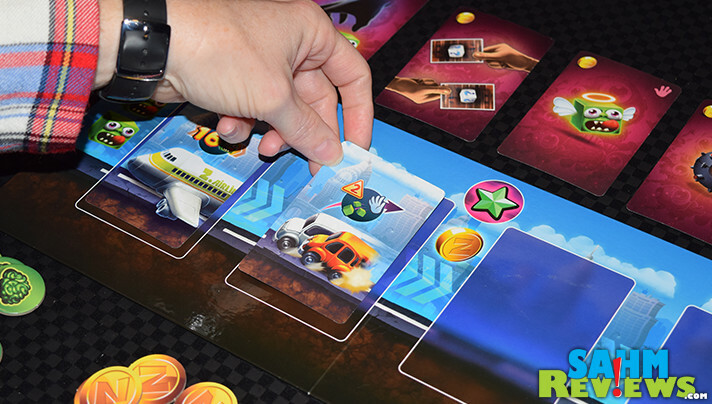 All players play at the same time and must resolve the card before the next one can be revealed. These cards might require you to roll all of your zombie cubes (causing you to lose any that land face-up), earn a coin or an additional zombie or even bomb other players (forcing them to lose any civilian tokens they have earned)! Between some of the card spaces on the board are icons that trigger special events. One gives you additional zombies for free, while others award you with a coin and send you to the shop to possibly spend them to purchase Shop Cards. These also award special actions like gaining civilians, stealing zombies from other players or bombing any number of players! With more than a dozen different card types, there will always be something new to purchase in the shop! Once all of the Street Cards spaces have been filled on the board, the round ends. Any civilians you have captured are turned into zombies and added to your horde. The shop is emptied and refilled with new cards and a new round begins! At any time during the game, if you meet the requirements of one or more of your Secret Bonus Cards, reveal the card and show that you have met the goal and gain its reward. After the third round is completed (and after all civilians have been converted into zombies) the game ends and the player with the most zombies in their horde wins Zombie Tsunami! And if this base game isn’t enough, each box also includes an optional expansion to Zombie Tsunami. The Zombird expansion adds special events, additional Shop Cards and a handful of Zombird Cards that award special abilities to the owner. 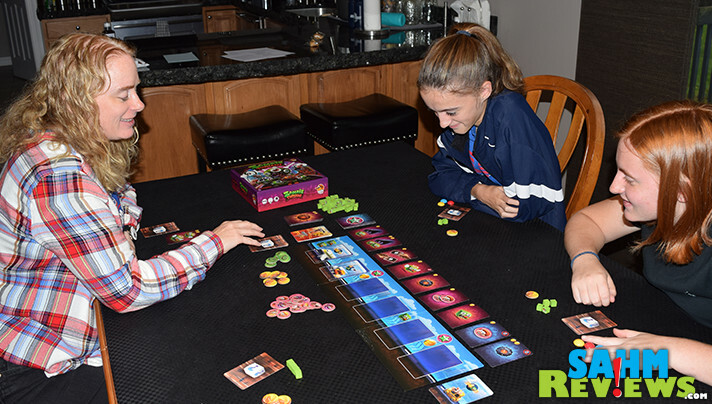 After a couple times playing through the base game, you’ll definitely want to utilize this expansion as it adds quite a bit of depth and confrontational interactions between players! This is another super-affordable party game available both on Amazon and at your favorite local game store. And while Zombie Tsunami is one of the first titles published by Lucky Duck Games, a quick check of their website proves it isn’t the last! Be sure to follow them on Facebook or Twitter to find out what they’re offering up next! What is your favorite zombie-themed game? This looks like a fun game for the entire family and a Zombie game is perfect for Halloween. We like to have a family game night at least 2 or 3 nights a month. The Zombies finally take over! 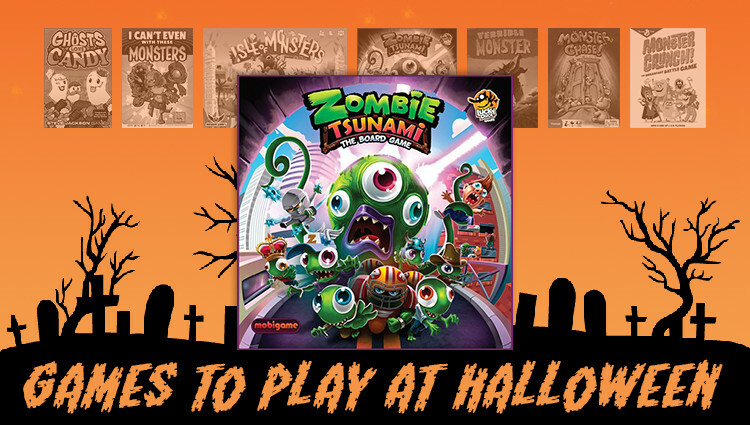 Zombie Tsunami Board Game looks like a fun game for Halloween! You guys get to play the funnest things! I don’t know a lot of zombie games but I will get into this one for sure. 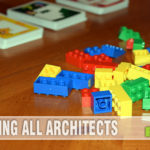 I need more holiday games for family nights. Adding this to my list! I don’t have a favorite zombie themed game as I have never player one. This one sounds like it should be fun however, so based on the description in your review, I would nominate Zombie Tsunami as my favorite. roll the zombies and see what happens, love it! Zombie Tsunami sounds somewhat scary. Never played a zombie themed game before. Omg! This looks like so much fun! I had never heard of it, thanks for showing it off! Definitely looks like a fun one for next Halloween!